On October 25th 2004, Matsuyama City entered an agreement to become a friendship city with Pyeongtaek City, Korea.During the signing ceremony many important people attended including Mayor Tokihiro Nakamura and Mayor Myeong-Ho Song, and an agreement was entered into promising exchange among the two cities. 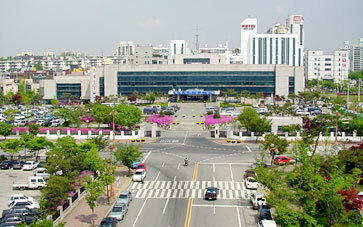 Pyeongtaek City is well known as a city of prosperous trade as it includes Pyeongtaek Port, one of the largest official national ports of Korea, and is continually being developed as an industrial city. Much exchange will take place in various areas including cultural and economic facets as this is the first friendship city within all of Asia. This is the third city to become an official exchange partner of Matsuyama city, following Sacramento of America and Freiburg of Germany.The addition of this new friendship city has been a large step towards the further internationalization of the city.